These are only some of the enthusiastic reviews onCOLIN JUDSONdifferent appearances as MIME, one of his favourite roles. His giftedtechnique and acting skills, have made of the British Tenor one of the most sought-after artists in his repertoire, performing in some of the best Opera Houses worldwide. 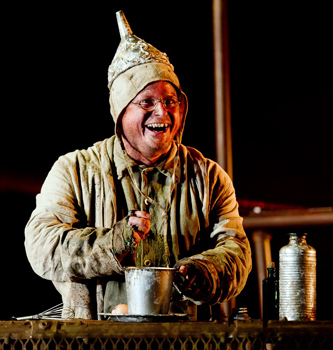 After his successful Royal Opera House Covent Garden Debut as PANG (Turandot) in 2005, he has returnedto the London Coliseum as SNOUT (A Midsummer Night’s Dream), KUNZ VOGELGESANG (Die Meistersinger von Nürnberg) or MONOSTATOS (Zauberflöte). Internationally he has been also acclaimed as SNOUT at Teatro Real Madrid and REMENDADO at the Tenerife Opera, JAQUINO for the Opera National de Bordeaux, MONOSTATOS for the Théâtre du Capitole Toulouse, SELLEM (The Rake’s Progress) at the Opera di Torino, BOB BOLES (Peter Grimes) for Opéra de Lyon, TRUFFALDINO (L’amour des trois oranges) at the Opéra de Limogesor his famous MIME, a role he has sung at Teatro Nacional de Sao Carlos in Lisbon, in the new production of Der Ring for the Opera National du Rhin, Helsinki Opera or the Longborough Festival. Colin Judson studied singing at the Guildhall School of Music and started his career with the English Touring Opera (WERTHER) and Glyndebourne covering the triple tenor parts of DER PRINZ, KAMMERDIENER, DER MARQUIS in Graham Vick's production of Lulu. Since then COLIN JUDSON has become a regular guest performer of the Glyndebourne Festival, singing CORYPHEE in Le Comte D'Ory, REMENDADO (Carmen, conducted by Philippe Jordan), ANDREW in Birtwistle'sThe Last Supper, SQUEAK (Billy Budd), BARDOLPH and DR. CAIUS (Falstaff), DON CURZIO (Le nozze di Figaro), INNKEEPER (The Cunning Little Vixen), PEDRILLO (Entführung) or VOGELGESANG (Meistersinger). In Germany, at the Cologne Opera, COLIN has appeared as HIRT/JUNGE SEEMANN (Tristan und Isolde), MONOSTATOS, SPOLETTA (Tosca), VENDITORE (Il Tabarro), GORO (Madama Butterfly) and GASTON (La Traviata). In 2001 he sang PEDRILLO (Die EntführungausdemSerail) and an acclaimed TRUFFALDINO in The Love of Three Oranges. In 2002 he made his début with Scottish Operaas ALFRED in Die Fledermaus, returning for BORSA (Rigoletto), SELLEM, JAQUINO, REMENDADO or L’INCREDIBILE (Andrea Chenier). At the English National Operahe was MONOSTATOS in their acclaimed production of The Magic Fluteand invited several times back to sing Salome (THIRD JEW), LORD LECHERY and CELESTIAL MESSENGER (The Pilgrim’s Progress), among many others. Concert appearances highlight Beethoven‘s 9th Symphony with the Royal Philharmonic, Britten's 'War Requiem' at the Megaron in Athens, or his performance in the Pavarotti Memorial Concert for the Italian Society in Edinburgh & Glasgow.Future engagements include VOGELGESANG (Meistersinger), SCHOOLMASTER (The cunning little Vixen) and SNOUT at the Glyndebourne Festival 2016. Just as impressive was Colin Judson's Mime, absolutely top-world-class..